The behemoth galaxy NGC 1275, also known as Perseus A, lies at the centre of Perseus Galaxy Cluster. By combining multi-wavelength images into this single composite, the dynamics of the galaxy become visible. Detail and structure from optical, radio and X-ray wavelengths have been combined for an aesthetically pleasing image which shows the violent events in the galaxy's heart. NGC 1275 is an active galaxy well-known for its radio source (Perseus A) and is a strong emitter of X-rays due to the presence of the supermassive black hole in its centre. 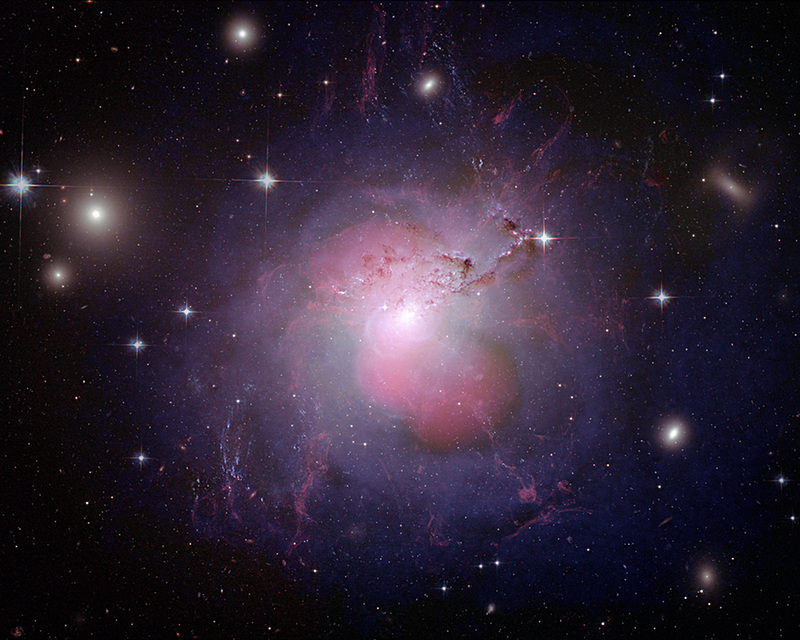 Hubble data from the Advanced Camera for Surveys covers visible-light wavelengths and is shown in the red, green and blue. Radio data from NRAO's Very Large Array at 0.91 m was also used. In this composite image, dust lanes, star-forming regions, hydrogen filaments, foreground stars, and background galaxies are contributions from the Hubble optical data. The X-ray data contributes to the soft but violet shells around the outside of the centre. 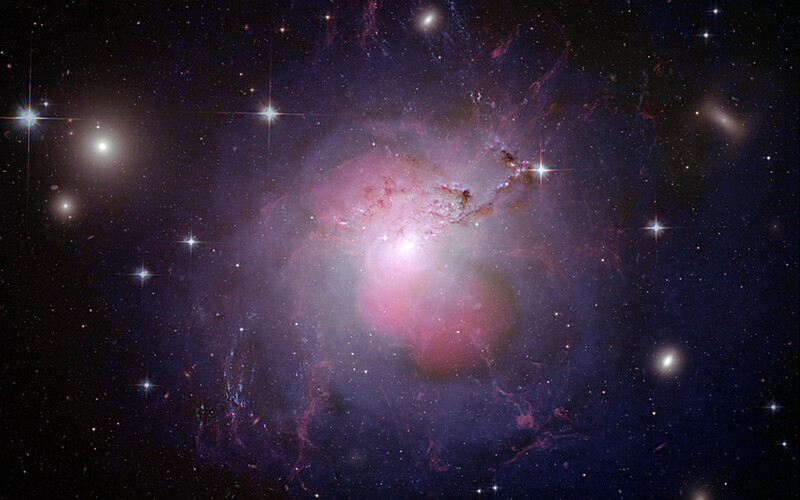 The pinkish lobes toward the centre of the galaxy are from radio emission. The radio jets from the black hole fill the X-ray cavities. Chandra data from the ACIS covers X-ray wavelengths from 0.1771 to 4.133 nm (0.3-7 KeV). Position (Dec): 41° 30' 41.21"